Source: After Mouzouras (1986, 1989). Note: data for gain in weight we adjusted with +/— loss in dry weight of controls; NA not tested. Equisetum fluviatile (Jones and Sloof, 1966; Webster and Davey, 1975). These in general were able to utilize simple sugars (glucose, maltose, sucrose) and also cellobiose, D-xylose and D-mannitol (Fell et al., 1973). There is no evidence that these marine basidiomycetous yeasts can utilize more complex polymers, for example lignocellulose. 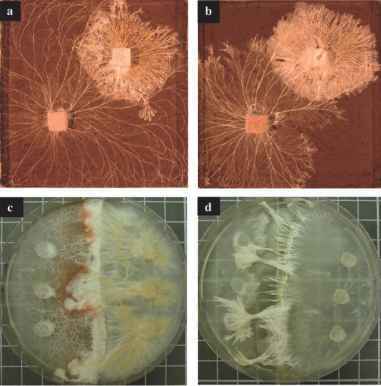 Most studies on lignocellulose decomposition by marine basidiomycetes have been on D. marina, Haloc. villosa and N. vibrissa (Mouzouras, 1986, 1989; Mouzouras et al., 1987). D. marina, Haloc. villosa and N. vibrissa were grown on test blocks of Fagus sylvatica, Pinus sylvestris and Ochroma lagopus and at two temperatures (10, 22°C). All caused weight loss of wood (Table 6) although this was much lower than in their terrestrial counterparts, for example more than 75% after 90 days incubation on birch wood, Ganoderma applanatum, Lenzites betulina, Trametes hirsuta (KMrik, 1974). Temperature affected their ability to cause decay, with Haloc. villosa causing a greater weight loss at the higher temperature (22°C) and conversely D. marina at the lower temperature 10°C (Mouzouras, 1986). The nature of the substratum also affected the weight loss caused by Haloc. villosa, for example 5.7% loss of A. alba and none in X. granatum, both mangrove timbers (Mouzouras, 1989), while on O. lagopus (a soft timber with a low lignin content) losses of 30% have been noted (Mouzouras, 1986). Source: After Rohrmann and Molitoris (1992). Note: Activity: +, presence of enzyme; —, no enzyme detected; w, weak; 1, clear reaction; 2, strong reaction; 3, very strong reaction. was almost identical in natural and artificial seawater media (Rohrmann et al., 1992). Different strains of N. vibrissa produce amylase, caseinase, cellulase, gelatinase, laminarinase, lipase, nitrate reductase, peroxidase and xylanase, but none produced tyrosinase (Schimpfhauser and Molitoris, 1991). Freshwater basidiomycetes have been isolated from decaying leaves, foam, woody debris, submerged test blocks and are able to breakdown major plant cell wall polysaccharides: pectins, cellulose and hemicellulose (Chamier, 1985). Their ability to degrade lignin remains to be established, although Marvanova and Bandoni (1987) listed Naiadella fluitans and Taeniospora spp. as laccase positive in an alpha-naphthol test (Stalpers, 1978).